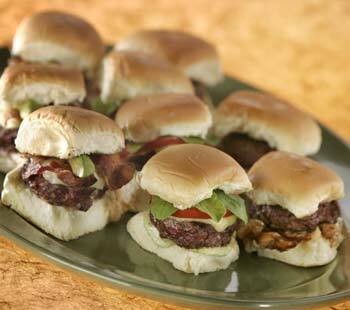 What better food for a 420 party than sliders? Why not accompany this snack with a viewing of Harold and Kumar Go to White Castle? The classic tiny hamburgers were invented in 1921 at the world’s first White Castle restaurant in Wichita, Kansas, where they originally sold for 5 cents each. Makes 16 sliders. Serving size: 4 sliders. In a medium bowl, combine ground beef, kief or ground hash, salt and pepper. Mix until cannabis and seasonings are well integrated into the beef. Divide beef mixture into 16 equal portions. Press each portion into a very thin round patty slightly larger than the circumference of the roll to allow for shrinkage. Stack patties between layers of waxed paper. Open rolls and spread each half with a thin smear of ketchup. Top half of each roll with a slice of cheese, folding and stacking the cheese as necessary to fit on the roll. Top the cheese with a sprinkling of chopped onions. Heat a large skillet or griddle over medium-low heat and spray with cooking spray. Cook burger patties for about 20 to 30 seconds per side or until just cooked through. Place cooked burger patty on roll, cover with second half of roll. Serve hot. Variations: Don’t be afraid to get creative with your slider toppings. While ketchup and onions are traditional, use whatever burger toppings you like best.